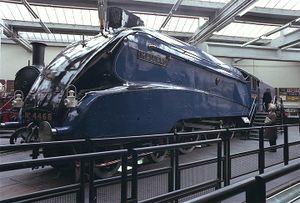 Mallard is the name of the locomotive that holds the world speed record for a steam locomotive. The locomotive is an A4-class "Pacific" (4-6-2) built by the London and North Eastern Railway (LNER) in Britain in 1938 as one of 35 A4-class locomotives. The A4 class was an streamlined improvement on the A3 class, and the product of the LNER's famous locomotive designer, Sir Nigel Gresley., and had 6'8" driving wheels. The LNER had been doing a number of speed trials with the A4 locomotives, and the four-month-old Mallard was the engine chosen to attempt to break the record on 3 July 1938. The dynamometer rolls recorded that it reached 126 m.p.h., although officially the record was claimed at 125 m.p.h., which was just enough to beat the previous record, held by the Germans, of 124.5 m.p.h. Mallard was originally numbered 4468, which was changed to 22 as part of a renumbering of locomotives in 1946. It was further changed to 60022 in 1948/49 after the LNER was included in the nationalised British Railways. The locomotive was withdrawn from service in 1963, but has been preserved, and is normally kept at the York Railway Museum. A number of other A4-class locomotives have also been preserved, including two outside Britain: one in the National Railroad Museum at Green Bay, Wisconsin, and one at the Canadian Railway Museum in Quebec. This page was last modified on 27 June 2016, at 20:11.